LULA™ machinery is developed specifically to ease the labour challenges faced by various industry sectors, by releasing valuable human resources to be used in areas where machine use is not possible or cost effective. Imagine for instance owning a backhoe that fits in virtually anywhere, can be drawn behind you pick-up truck, can be manoeuvred and operated by one person and is also affordable. 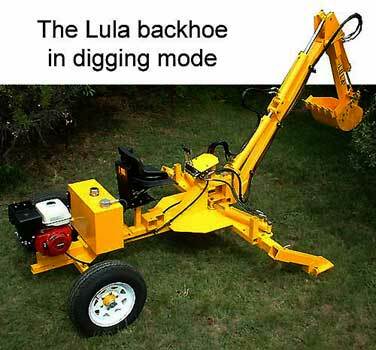 The new LULA™ 410 Backhoe is such a machine. It saves you money, time and manpower. Its simple operation is mastered within only a few hours of practice. Within the time that you normally wait for a contrator to arrive, the job can be done already. The LULA™ 410 is manufactured in South Africa from spares and materials that are available directly to the public from any hardware store or Co-op. Its simple, robust construction allows for easy maintenance or repairs. No specialist skills or costly services are necessary. Crutchfield Engineering’s primary objective was the machine design, prototype design and rapid prototyping, of products and services appropriate to the African market.